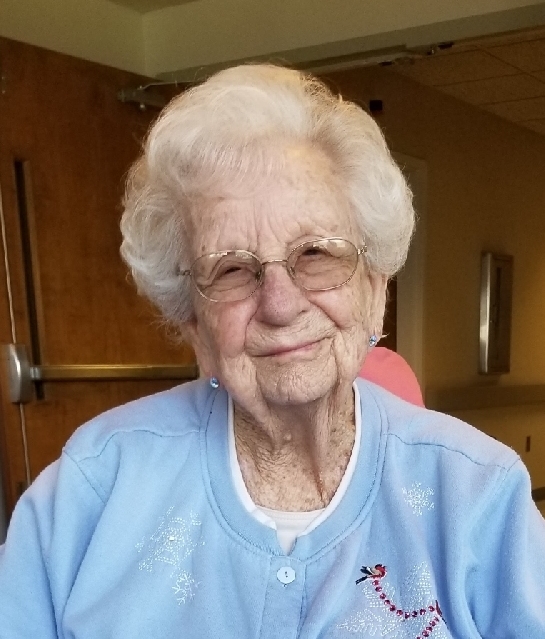 Margaret Alice Ritchie, 93, wife of the late Cecil Ritchie, passed away Sunday, September 23, 2018 at Johnson-Mathers Nursing Home. Born November 26, 1924 in Harrison County to the late Jacob & Flodie Fryman, Mamma Mag was a devoted homemaker, beloved wife, mother & grandmother. She was a lifelong member of Lair United Methodist Church where her father had served as pastor, carrying on his musical talents. Survivors include 2 sons, Cecil (Nelda) Ritchie & Michael (Debbie)Ritchie; a sister, Sudie Sanders; a brother-in-law, James (Louise)Gates; and 9 grandchildren: Ann Ritchie, Doug Ritchie, Marty Ritchie,Mike Ritchie, Timmy Ritchie, Kelvin Winkle, Kelly Winkle, Seth Currans and Erinn Hill, 17 great-grandchildren and 3 great-great-grandchildren along with a host of nieces and nephews. Also preceding her in death were 5 brothers: Todd, John, Otis, Elmer & Tommy Fryman; 2 sisters, Heelen Nichols & Alberta Franklin; and a grandson, Greg Ritchie. Services will be 11:00 A.M. Thursday, September 27, 2018 at Drake-Whaley-McCarty Funeral Home officiated by Marty Ritchie. Burial will follow in Battle Grove Cemetery. Visitation will be after 5:00 P.M. Wednesday.